Parents, when you book your appointment this month, we will do a check up and clean for your child for free. At Beenleigh Marketplace Dental, Dr Casey Tseng, Dr Jason Tung and the entire team are committed to offering you and your family comprehensive dental care in a modern, safe and friendly environment. With this team of dental professionals, we can ensure our patients receive the most comprehensive and high-quality treatment available. Built on the foundations of exceptional dental care and service, Beenleigh Marketplace Dental is a well-established dental clinic. Our dental practice is equipped with the latest technology so that we can offer our patients an extensive selection of cosmetic, general and restorative dental treatments. We pride ourselves on our patient service. Whether you are coming in for a regular check-up or a dental implant, we treat all patients with the care and respect you deserve. Before commencing any treatment, our friendly team will assess your smile, listen to what results you are hoping to achieve by the end of your treatment, and discuss how to best attain these results. Our team happily works with patients of all ages. From babies with their first tooth to our older patients looking to get dentures we have the treatments and the skills to help you. A general check-up and clean every six months helps to you to keep optimal oral health and maintain your natural teeth for longer. At general check-up appointment, one of our dentists will assess your oral health, check your gum health and take x-rays of your teeth and jaws. Your teeth will receive a deep scale and clean, this type of cleaning you can only get from a dentist. Beenleigh Marketplace Dental are a health fund provider for BUPA, CBHS, TUH, HCF and smile.com. In fact, our HICAPS terminal is linked up to a total of 46 private health funds. This means you can instantly claim your benefits when you swipe your card at the end of your appointment. If you are a DVA (Department of Veteran Affairs) card holder we can bulk bill most treatments, although laboratory work may require some small fee. We strive to provide you with a pleasant experience and the best personal service. Lots of people feel uncomfortable with the thought of visiting the dentist. University of Adelaide did a study and found around 10 to 15% of Australian adults have dental anxiety. This desire to avoid the dentist sees many adult patients with poor oral health. And in many cases this can—among other things—cause other health problems. We offer sedation dentistry, a pleasant way of providing pain relief and relaxation. Many patients who are uncomfortable with the dentist find this option has helped them receive the treatment they need. Beenleigh Marketplace Dental is located only a few suburbs south of Brisbane CBD just off the Pacific Motorway and only a short drive to the Hyperdome Shopping Centre. Our central location is just blocks from Beenleigh Train Station with ample parking close to our practice. We have also made our Beenleigh practice easily accesable for persons with limited mobility. 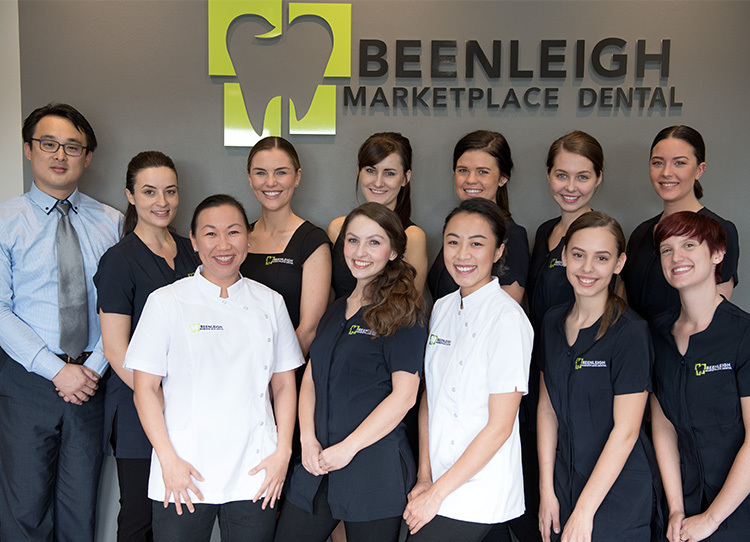 If you’re living in Beenleigh, or the greater Brisbane area and would like an experienced and skilled team of dental professionals with years of experience, come in and visit the team at Beenleigh Marketplace Dental. Beenleigh, Alberton, Bethania, Eagleby, Edens Landing, Holmview, Jacobs Well, Mount Warren Park, Pimpama, Ormeau, Tamborine, Waterford, Windaroo, Yatala.